SACRED ART - THE BOOK! Marvellous book! I had the pleasure of getting to read the manuscript - this is a much needed resource! "Imelda Almqvist's work is life-changing! Her books, classes and visionary art are portals leading to inner change and personal transformation." ~Michael Butler Smith (Shamanic Practitioner and Author of Embracing Isis: A Witch's Guide to the Great Goddess. I am overjoyed to report that my second book will be published by Moon Books on March 29th, 2019! - Terry Morgan, astrologer,healer, shamanic practitioner and teacher, U.S.
- Sandra Ingerman, author of "Soul Retrieval" and "Medicine for the Earth"
This book tells the story of sacred art and presents the key principles underlying the creation and uses of sacred art across cultures. continents and different periods in human history. It makes a plea for healing the divisions within the world of art and restoring sacred art to its rightful place in our awareness.For most of European and world history all art was sacred art! The author presents art as a mystery school process and vessel for alchemical processes unfolding on the level of soul. Along the way forgotten gods are encountered and the shadow aspects of creativity are explored along with the blessings and gifts. Making sacred art means stepping outside the realm of "ego-led consciousness" to become a hollow bone for spirit. When we connect to this force greater than ourselves, creative blocks do not exist.Creativity is our birth right and the greatest piece of art we will ever make is our own life! Throughout history we humans have made sense of the world through art and symbols that transcend the linear thinking and entrapment in language of a world restricted by beliefs and the current perceptions of our culture. Art liberates the soul and responds to the questions that can't be answered or asked in the ineffable world that defies description. In her latest book, Sacred Art, Imelda shows us how any one of us can access the sacred world of the soul by becoming a hollow vessel for spirit to authentically and artistically express itself through us. Doing the practices in this book will turn your life into an artistic expression of your soul's longing! The title of this book brings the heart into the throat, because yes –! didn't Art begin this way? And if so, is it too late? Can we find a way forward by returning to a place where “Art” is deliberately carried out within a larger framework of sacred and spiritual practices that gently guide each person along a path to the best possible life? Author Imelda Almqvist takes you through a set of personal intuitive decisions that accumulated of their own accord until she realized that she has never been painting or teaching a branch of modern art, but crafting “a Mystery school experience” for students from all over the world. 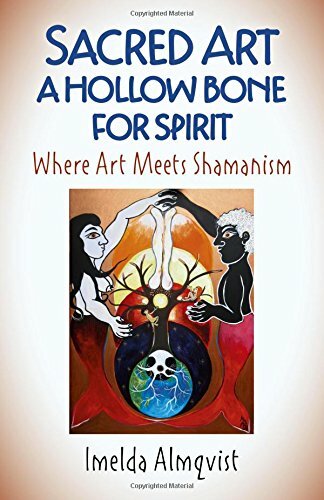 - Anita Sullivan, poet, U.S.
Imelda Almqvist has created a unique and valuable resource in Sacred Art: A Hollow Bone for Spirit. She takes the reader on a worldwide journey across the ages, through sacred art as an expression of the human spirit and of our relationship with the rest of the cosmos. But more than that, she engages the reader in their own process, leading them through activities in every chapter that deepen the understanding of both the creation of sacred art and the spiritual connection that creation provides. This is a profoundly valuable experience, both in the knowing and in the doing, an aspect of life that is often lacking in the modern world, our own personal Mystery School. This book fills that void, offering us all a way to reconnect with our deeper selves and with the universe itself. In the end, then, we receive the greatest gift of all: a way to reconnect with each other.